Artist's depiction of NASA's Europa flyby spacecraft, which the agency aims to launch in the 2020s. The team mapping out NASA's mission to the ocean-harboring Jupiter moon Europa met for the first time last week. Scientists and engineers on the mission, which seeks to determine if Europa is capable of supporting life, got together at NASA's Jet Propulsion Laboratory (JPL) in Pasadena, California. The chief goal of this first meeting was to start refining the mission's planned science operations, with a particular emphasis on how its nine instruments will work together to investigate Europa's habitability, agency officials said. "That's why we're here, in one room, at the very start of the project," Robert Pappalardo, Europa project scientist at JPL, said at the meeting, according to a NASA press release. "So we can begin to function as one team, to understand the cross-cutting science issues we all face, and so we can use all of our tools together to understand Europa." 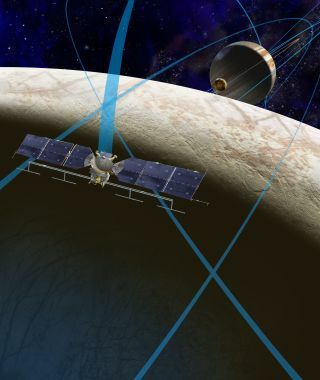 NASA aims to launch the as-yet-unnamed Europa mission, which will likely cost about $2 billion, in the early to mid-2020s. The spacecraft would reach Jupiter in about eight years if launched on currently available rockets, and in less than three years if lofted by NASA's in-development Space Launch System megarocket, NASA officials have said. Once in orbit around Jupiter, the robotic spacecraft will perform about 45 flybys of the 1,900-mile-wide (3,100 kilometers) Europa, which is believed to contain a sea of liquid water beneath its icy shell, over the course of about two and a half years. The Europa probe's supersharp cameras, heat detector, ice-penetrating radar and other instruments will shed light on the Jovian moon's surface composition and the nature of its subsurface ocean, among other things, NASA officials have said. "We have a rare and wonderful opportunity with this mission to investigate whether Europa could be an abode for life," said Curt Niebur, Europa mission program scientist at NASA Headquarters in Washington, "We're in the service of our colleagues, our scientific community, our country and our fellow human beings. It's a responsibility we take very seriously." The Europa probe won't actively search for signs of life. NASA officials have said they'd like to mount a life-detection mission to the Jupiter moon in the future — perhaps one that gets under the ice shell and samples the ocean directly.